Welcome to Snowy Peaks Junior High and High School! Welcome to the Snowy Peaks Learning Community! This school year promises to be a great year. We are extremely proud of our successes in helping students thrive and providing Snowy Peaks JH/HS students with the tools they need to be successful and effective citizens in the 21st Century. We will teach the whole child, focusing on Academics, Character, Community, and Nature. We will create a relationship-based environment, where every student feels supported. We will give every student an individualized education and do whatever it takes to see every child thrive. We will have a relentless focus on learning. As educators, we will embrace a growth mindset. We will prepare all students for Post-Secondary success and help them pursue education after high school. Academics: At Snowy Peaks, each student will display proficiency in high school academic standards. We achieve this goal focusing on individualized instruction, providing experiential and project-based learning opportunities, developing strong mentorship and relationships with our students, and dedicating ourselves to a growth mindset in education. At Snowy Peaks, our passionate staff creates an individualized plan for every student, and we pride ourselves on working tirelessly to meet every student’s needs. Character Education: Character education is embedded in all that we do. Students and staff create a culture of dignity, integrity, and respect, and we will demonstrate these values both in our school and in our community. Student safety and well-being is of primary importance at Snowy Peaks, and as a result of the daily focus on character education, the school community has frequently been described as a family. In a school of this size, staff and students will attest that bullying is non-existent, and respectful behavior is the norm. A focus on a proactive and positive behavior system is at the heart of the school’s culture because we know that who we are is equally as important as what we know and can do. Community Service Learning: Albert Einstein once shared, “The aim [of education] must be the training of independently acting and thinking individuals who, however, see in the service to the community their highest life problem.” We aim to foster a healthy balance between a young person’s individual aspirations and her or his responsibility as a positive and productive citizen. Community Service Learning extends beyond the classroom walls and allows students develop their sense of social responsibility, improving the skills that will enable them to make effective contributions to the world in which we live. Nature: At Snowy Peaks, students are encouraged to foster a connection with nature through experiential and expeditionary learning. Students will understand their impact in the world and learn to incorporate principles of sustainability into their lives. We believe that direct experience in nature and the outdoors helps students develop a sense of place, fosters creativity, and promotes social and emotional well-being. We look forward to facilitating student success throughout the coming year. If you have any questions, comments, or concerns, please feel free to contact us. Students determine daily objectives and goals in each content area and progress -monitor their academic growth regularly. Each student will receive a Personalized Learning Plan that will meet their individual needs. All students are expected to master content, and in the school’s new blended learning format, teachers can support students in this goal. The student’s instruction within a class should be individualized, not collective. Students receive formative feedback, regular progress reports, face-to-face feedback, and data-driven assistance every day. Science, Technology, Engineering, Arts, and Mathematics (STEAM) focused project-based learning will deepen student understanding. Collaboration, expeditionary learning, outdoor education, and physical activity will encourage engagement away from technology. Expeditionary Learning: Learning best takes place when students gain firsthand experience by embedding themselves in “the field.” Focuses will include STEAM, 21st Century Skills, Career and Technical Skills, Internship and Job Shadow Opportunities. Advisory opportunities and student mentorship will be a focus. Weekly one-on-one meetings for progress monitoring will occur each Friday. Mandatory grouped advisory meetings will occur on Friday afternoons. By developing students’ sense of social responsibility, they will gain skills that will enable them to make effective contributions to the world in which we live. Direct experience in nature helps students understand their impact on the world, develop a sense of place, fosters creativity, and promotes social and emotional well-being. I am honored to have the outstanding privilege of being the principal of the incredible Snowy Peaks High School. 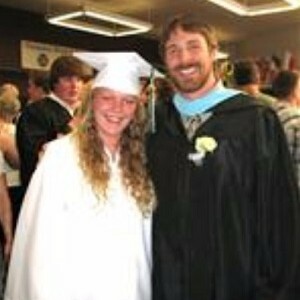 In 2002, I moved to Summit County and joined the Summit School District as a high school English teacher. Over the past thirteen years, I have fallen in love with all that Summit County has to offer, especially our school district that provides such exceptional educational opportunities for our students. Four years ago, I proudly made the transition into school administration, having served as Summit High School’s Assistant Principal and Dean of Students. 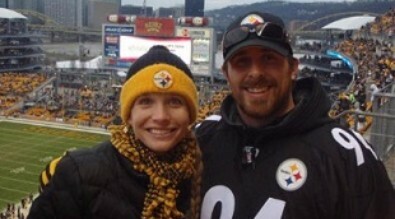 Additionally, during my time in Summit County, I also fell in love with my wife, Ashley, who is a sixth grade Language Arts teacher, and we’ve decided that Summit County is a fantastic place to continue to make our home. Throughout my tenure in the Summit School District, I have dedicated myself to the success of my students, and I look forward to continuing to serve your sons and daughters as the principal of Snow Peaks High School. I recognize that today’s youth face countless personal and academic obstacles, and providing students an educational environment where each young man or woman can thrive is my greatest passion. I love waking up every morning to educate and mentor Summit County’s students; they inspire me on a daily basis. I look forward to building upon the successes already achieved by the amazing Snowy Peaks staff, and by utilizing my unique skill set to provide individualized educational opportunities for your sons and daughters, I am certain that even further success is on the horizon. Partnering with you and your children, we anticipate a phenomenal school year. As a principal, I realize the education of children is a difficult job, one that cannot be accomplished without the assistance of you, the parents, and the surrounding community. I encourage you to be an active participant in the education of your child. There are many ways to participate in the education of your sons or daughters; however, the easiest way is to maintain regular, effective lines of communication. We welcome ideas and volunteers both now while we are preparing for the upcoming school year and throughout the year as well. If you have concerns, praises, or suggestions on how we can better meet the needs of your sons or daughters, please do not hesitate to contact me. In closing, I would like to thank the Summit School District staff, the Board of Education, and you, the community, for their unwavering support of our school. I will work diligently to continue to provide an excellent educational experience for your children, the students of Snowy Peaks. or Searching for deep snow! 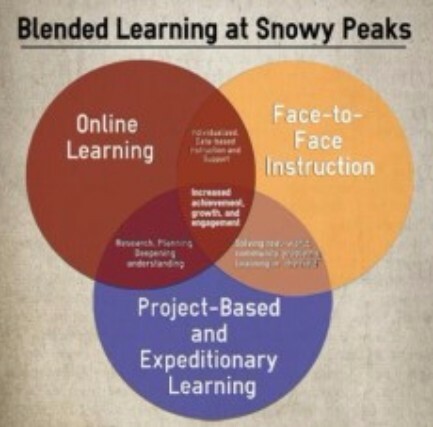 Beginning in the 2015-16 school year, Snowy Peaks High School will revise its current framework and begin using a blended learning model for its curriculum delivery and enrichment. In order to increase students’ growth, achievement, and engagement, the school will “blend” online curriculum delivery with hands-on, engaging, project-based learning opportunities that promote growth in STEAM (Science, Technology, Engineering, Arts, and Math). 1. Do all students learn the same way? Of course not! Teaching should be individualized and focused on the specific knowledge and skills of each student. 2. What is the best use of teacher and student face-to-face interactions? Teacher/student interactions should no longer revolve around passive learning, where students spend their time taking in raw content at the pace of the class. Instead, student and teacher interactions are dynamic, where students actively explore real-world problems and deepen knowledge by exploring, investigating, and responding to a complex question, problem, or challenge. Online learning: Blended learning is a formal education program in which a student learns, at least in part, through an online curriculum, with some element of student control. Students will complete their work in our new, innovative, library-style learning center with direct one-on-one support with their highly qualified teachers. Supervised Brick-and Mortar Location: Contrary to a virtual school model, students attend school each day and learn in a supervised brick-and-mortar location, where their highly qualified teachers are immediately accessible. This enables them to receive direct support from their teachers as they work towards mastery of content. Integrated Learning Experience: The different learning modes are interconnected to provide an integrated learning experience. Face-to-face teacher and student components will shift to authentic assessment and project-based learning opportunities to deepen the understanding gained in the online curriculum. The teacher moves from the “sage on the stage,” to a project designer, collaborator, mentor, orchestrator, facilitator, and an inspirer, while the student moves through the curriculum at the pace that best fits his/her needs. Blended classrooms allow teachers more time to teach students 21st century skills, rather than teaching the raw content to the students. Teachers help develop students’ critical thinking skills; differentiate and individualize instruction; remediate in smaller, targeted groups; extend lesson concepts; and develop project-based skills, such as collaboration, communication, creative problem solving. Snowy Peaks High School embraces the ideals behind the Innovation Learning movement, as made evident by its implementation of Blended Learning in the 2015-2016 school year. We share the Colorado Department of Education's Innovation Learning Department's goal to "Ignite the unique potential of every student." According to the Colorado Department of Education (CDE), the goal of Innovation Learning is to "integrate a vast range of new and existing teaching and learning tools, resources, modules and approaches into more personalized, engaging and relevant learning experiences that tap into each student's passions, interests and learning styles inside and outside of the classroom." More information can be found on CDE's website. To view, click HERE.